The internal combustion engine produces a lot of toxic pollutants and emissions after the air and fuel mixture is ignited. Fortunately, these emissions are controlled by a special device in the exhaust system called a catalytic converter. This device is able to convert the hazardous emission gases from the engine into less-toxic gases. That way, they will not do as much harm to the environment or the health of the people who breathe in the air. You will find a catalytic converter in a diesel engine and gasoline engine. The catalytic converter looks like a canister made of metals, such as rhodium, platinum, and palladium. It is usually located close to the engine inside of the exhaust system. As the toxic gases from the engine make their way throughout the catalytic converter, a series of chemical reactions take place. Most of the hydrocarbons, nitrogen oxides and carbon monoxide in the exhaust emissions are eliminated. The result is less-toxic emissions being released through the tailpipe. Having a functional catalytic converter might not seem like any big deal, but it is important if you care about the environment and making it healthier. Furthermore, most catalytic converter problems are caused by problems with the internal combustion engine. For instance, if the engine were to fail at igniting the fuel, the exhaust system could end up with lots of raw fuel. This could hurt the catalytic converter significantly. The most common causes of a bad catalytic converter include bad spark plugs, bad ignition coil, fuel pressure regulator leak, and bad fuel injectors. You are not expected to know which one of these is causing your catalytic converter to go bad. But what you do need to educate yourself on are the symptoms which come from having a bad catalytic converter. You will find these symptoms to be more serious than you might think. If you experience any of these symptoms, it is in your best interest to take your vehicle to an auto mechanic and have them diagnose the problem. More than likely, they will find the catalytic converter to be at fault. Then, this component can be replaced. And if an engine issue caused the converter to malfunction, that issue can be addressed too. Below are the top 5 symptoms of a bad catalytic converter. 1) Warning Light – On your dashboard, the “Check Engine” warning light could illuminate if an engine problem has caused your catalytic converter to malfunction. Obviously, you won’t know this for sure until you have a mechanic run a diagnosis through your engine control unit. But still, a Check Engine warning light should motivate you to go to the mechanic in the first place. Do not wait for it to magically go away on its own because that is not going to happen. 2) Sulfur Odor – You ever wonder why gas smells like rotten eggs? That is because it contains sulfur in it. After the combustion process, the sulfur becomes hydrogen sulfide. Then it goes through the catalytic converter and becomes sulfur dioxide. This is a gas that you cannot smell at all. But if you have a bad catalytic converter, the hydrogen sulfide will remain in the exhaust system. This will cause the smell of rotten eggs to be potent in the passenger cabin. 3) Weak Engine Performance – A malfunctioning catalytic converter will create a blockage in the exhaust system because so much raw fuel will ignite inside the converter. This increases deterioration, resulting in a restriction of the exhaust flow. Once that happens, the engine won’t be able to produce enough power to satisfy the demands put on it. 4) Rattling Sounds – The catalytic converter has a metal casing which may break apart if it’s worn out or damaged. This will be noticeable to the driver because rattling sounds will be heard coming from the engine as it runs. If these metal pieces of casing were to break off, they could potentially get caught in the muffler. This will cause a lot more problems. So, it is best to do something about these sounds before something worse happens. 5) Failed Emissions Test – There are some states which require vehicles to have emissions tests every 6 months or so. This is to make sure they are compliant with state regulations surrounding carbon emissions. They don’t want engines releasing too many harmful emissions, so this is their way of stopping that. However, if you have a bad catalytic converter, then it will fail to make your vehicle’s emissions safe. This will be discovered if your vehicle undergoes its required emissions test and ends up failing it. The catalytic converter is not exactly a cheap device. 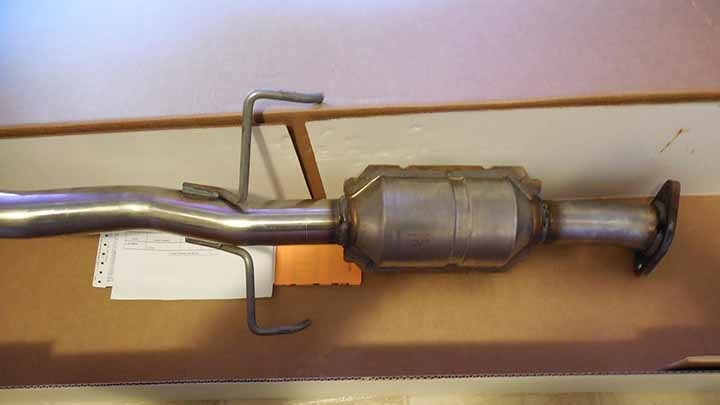 Once your catalytic converter goes bad, you will need to prepare yourself for the expense of replacing it. On average, the cost to replace the catalytic converter will be anywhere from $1,230 to $1,670. The parts cost alone will be anywhere from $1,100 to $1,500 for the converter component. The labor costs depend on the hourly rate of the mechanic, but the total labor expense is usually around $130 to $170. There are taxes and other fees usually added onto the total price as well. Since the engine generally causes catalytic converter problems, the converter typically gets replaced as the mechanic works on the engine issues too. Whatever is wrong with the engine, that will be an additional expense on top of the replacement costs for the catalytic converter. Keep that in mind.